on Sundays during the hours of 6 PM to 10 PM for regularly scheduled enterprise maintenance. Please be aware that the cardholder's billing zip code will be verified when processing a transaction. in to a processed state. A temporary hold of these funds will take three to five business days to release back to the cardholder. Welcome to the Clerk of the Circuit Court's Online Copy Request and Payment Center. This site is for the convenience of submitting online copy requests and paying for such copies via the use of a Visa, MasterCard, American Express or Discover only. This site is just one method available for requesting copies of documents from the Clerk's office. Copies may also be obtained by visiting any of our office locations where you can pay by cash, check or credit card. Copies may also be requested by email and paid for by credit card or by sending a check. Deposit accounts are also available whereby the cost of records requested via email, phone or in person can be deducted from an established deposit account at the requestor's direction. For more information on establishing or ordering from a deposit account please go to www.pinellasclerk.org. An order made through the Clerk's Online Copy Request and Payment Center must be paid for by credit card. You cannot use this site if you wish to pay for the records from your deposit account or by other payment type. There is a 3.5% fee charged by the credit card processor for the use of a credit card to pay for the records requested. This fee is not shared with the Clerk. This fee is not a charge for the records requested, but is related solely to the method of payment. When submitting document requests to this site, name and address information will be required for mailing and payment verification purposes only. 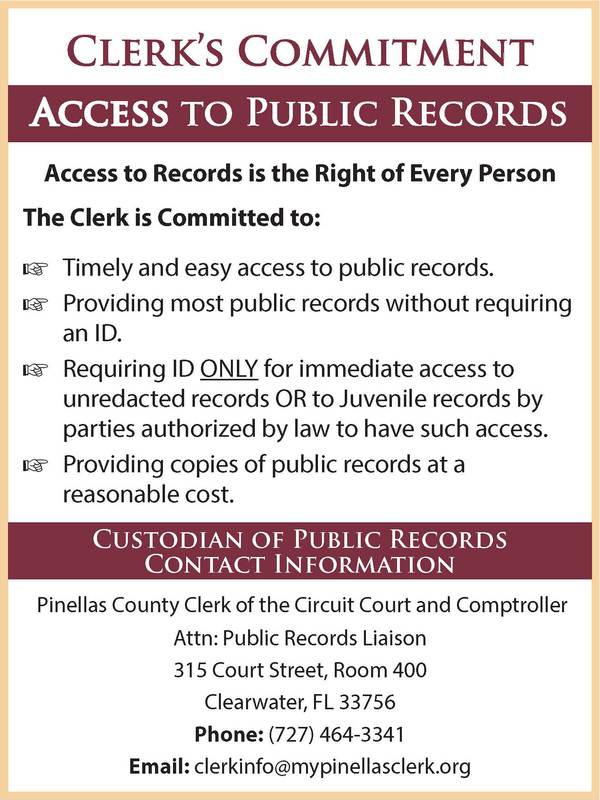 Should you not wish to provide this information, you may request and obtain copies of public records at any one of our office locations with a cash payment. Once your copy request is submitted, Clerk's Office staff will calculate page counts and costs. You will be invoiced for the total cost and provided a secure link for payment via the email address you provide. You can also return to this page with your order number and select the "Pay existing Order by Credit Card" link below to make your payment. Copies requested on this site may be sent to you via U.S. postal service or email. Emailed copies will not require a postage charge. If copies are provided to you by U.S. postal service, the postage charge will be included in the invoice emailed to you. All certified copies must be mailed to the requestor; therefore a physical address is required. Many documents throughout the various court areas may be confidential or exempt from disclosure, and therefore will not be available for copies. In the event a document cannot be produced in whole or in part because it is confidential or exempt from disclosure, the Clerk will notify you of the unavailability of the record and the basis for such unavailability. PLEASE NOTE: Customers may only request copies from one court area at a time. For instance, if you need to request copies from both the Criminal Court Records and Civil Court Records, you will need to place each order separately.